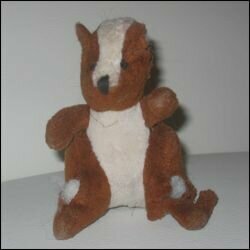 Squirrely: My person just wants to put a band-aid on the squirrel. She’s been through a lot and her stuffing is popping out all over the place. It won’t be long before she joins the Heads collection. See No Evil, Sniff No Evil: I’ve removed the eyes and nose from my Monkey along with one leg. I don’t play with him very often, so he’s been in this condition for quite some time. He will make an excellent addition to my Heads collection as soon as I get around to destuffing and detaching him. Legless Lamb: Lambie is another of my favorites. I like chewing her like gum. She’s been through the washing machine and dishwasher several times. Despite the fact that she’s missing her left legs, she’s hanging on and is in otherwise excellent but dirty condition. I probably won’t pull her head off anytime soon. Brown Dog: This little brown dog is Harley’s favorite toy. It’s been in the family longer than me. He pretty much guards it with his life, so I haven’t been able to do much damage to Brown Dog. I took it upon myself to dock his tail while Harley was outside one day. He took Brown Dog with him when he went out to pee for a few weeks after that, so I’ve decided to just leave that one alone for now since he’s obviously attached to it. There’s one more stuffed animal, a blue dog named Blueberry, in the ‘Damaged by Still Mostly Intact’ category. You’ll notice he’s not in the photo. I tried taking him swimming and it didn’t go so well. He’s down at the bottom of the pool, waterlogged and chlorinated, waiting for my person to fish him out. BOL at the brown dog bit!!! Poor Harley!